The Nebraska Unicameral, is, as we all know, a one house legislative body, and, officially "non-partisan". After having observed the legislative process for quite some time, both from a distance, and up close, we stopped puzzling over this paradigm. With a Republican administration and a Republican super-majority in the Unicameral, the issue of CIR reform was STILL commandeered by Democrats and Unions? Really? Our state legislators in the Unicameral, who are a Republican super-majority in numbers capable of monopolizing committee chairmanships and enacting any piece of legislation without the support of a single Democrat..."
Under Unicameral rules, only a simple majority (i.e., 25 voting in favor) is necessary to pass most bills and to elect committee chairs, 30 are required to adopt a constitutional amendment, and 33 are required to pass a bill containing an emergency clause OR TO BREAK A FILIBUSTER. IF ALL 36 REPUBLICAN SENATORS STOOD FOR THE PRINCIPLES OF THEIR PARTY AND VOTED ACCORDINGLY, THEY WOULD PREVAIL ON EVERY VOTE. Of course, the Super Majority DID lose strength this session. Well. Not really. Senator Brad Ashford switched from being a Republican to an Independent. At this point, that seems very much like a distinction without a difference. Let's see. 35 is greater than 25, 30, AND 33. Yep. Still a super-majority. In the U.S. Senate, procedural rules allow a 3/5 majority - that is 60 votes - to break a filibuster. That is why a 61 member majority is considered "filibuster proof". In 2009, Democrats had a nearly filibuster-proof majority, with essentially, 60 members[1. Recall that in the 2008 elections, Republicans lost 8 seats to Democrats, and the body's 2 Independents caucused with the Democrats to make a 59 member majority. Pennsylvania Senator Arlen Specter switched parties from Republican to Democrat in 2009, making a 60 member majority. ], and they still managed to neutralize Republican impact (such that was attempted). Of course, having a huge number of Senators with an "R" behind their name in the U.S. Senate would ensure little. That "R" would have to stand for certain things and result in certain actions. In the Nebraska Legislature the designation of "R" in such large numbers is CLEARLY not enough. It IS true that the Nebraska Unicameral is NOT the United States Senate. The Republican and Democratic Party designations are officially NOT a part of the legislative process. There are no majorities or minorities. It is one body. Regarding the label of "nonpartisan" - while much could be said - I'll confine myself and focus on one aspect. What is the definition of "partisan", anyway? "one who takes part with another, zealous supporter,"
Also used in Italy as, "member of a faction, partner" and as "part, party", later (1690s) associated with guerilla fighter, in the 18th Century associated with warfare, and in the 19th Century in politics. "A fervent, sometimes militant supporter or proponent of a party, cause, faction, person, or idea." Throughout history, then, the word "partisan" has mostly carried a negative connotation. In the name of Progress, and the interests of "the people" , a negative influence, called partisanship, was removed from Nebraska's legislative process through the 1919-1920 Constitutional Convention[2. While the 1919-1920 Nebraska Constitutional Convention is definitely a subject of high interest, at least to us, this article is not the place to run through the many issues. Some readers, however, may be interested in checking out the article to which I linked in the text, "The Nebraska Constitution" by Judge William C. Dorsey, written in the 1921 Constitutional Review. Proponents of the changes in 1919-1920, particularly famous son, George Norris, promised a more open government and more investment by the people of Nebraska. From Judge Dorsey, "...the result most clearly and forcibly revealed is the removal in many important particulars of the restrictions heretofore imposed by the current constitution and the consequent enlargement of legislative power." The full text Nebraska Constitution can be viewed HERE.]. The Legislature was converted from the traditional bicameral legislature to what it is today. We contend that Nebraska is, essentially a one party state, and it naturally follows that it is one party Legislature. BUT, whatever it is, it's not Republican IF Republican stands for Constitutional, limited government which protects individual liberty, property rights, and state sovereignty. "For some inexplicable reason, there is a mythology that Nebraska is a very fiscally conservative state that is in so much better shape than many others. Nebraska has the highest overall taxation rate in a nine state area – - – fiscal responsibility, anyone? The state ranks in the top ten nationwide in the number of employees who work for state or local government – - – is that SMALL GOVERNMENT??? Nebraska ranks in the top ten states in its number of illegal immigrants. There’s been a recent push in the Unicameral to extend Medicaid coverage to illegals and to grant them in-state tuition and other benefits of citizenship…this is fiscal responsibility??" The Legislature, remember, has the power of the purse. 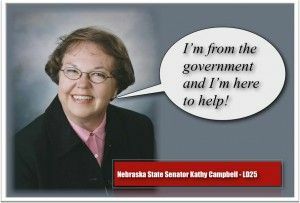 Scroll back up and take a look at the picture of Senator Kathy Campbell, the featured image for Linda's article, which has Senator Campbell saying, "I'm from the government and I'm here to help." Let's be very clear, about what that meant. LB239, "Require presentation of government-issued photographic identification to vote in elections"
As of Wednesday, March 28, this bill is effectively dead. Two Senators were absent when the cloture vote was called: John Seiler, deceased Senator Dennis Utter's appointed replacement is currently hospitalized, and Senator Abbie Cornett was also absent. Senator Russ Karpisek is a DEMOCRAT and he voted FOR cloture. I just happen to know Senator Campbell is a Republican. Beyond that and beyond having the number of Republicans and Democrats reported by multiple sources, I simply don't know and I'm not going to try to figure out which party each of the Senator affiliates with, it's too time consuming. LB239 was not a GREAT bill. I see flaws in it. BUT, none of such grave concern that they overwhelm the basic premise of ensuring that voter registration is done by a CITIZEN and that, when voting the person presenting themselves (or their ballot) is the same lawfully REGISTERED VOTER, and that CITIZENS only vote ONCE. Why would this same bunch rubber stamp a REAL ID law (driver's license, state ID) that sends your and my information off to a third party vendor in Virginia, not scramble to vote for this? Why wasn't this issue so obviously a priority to the super majority of Republicans in the Unicameral to ensure that there was no way it could be blocked? Senator Janssen offered the following motion: MO87 Invoke cloture pursuant to Rule 7, Section 10. Senator Janssen moved for a call of the house. The motion prevailed with 38 ayes, 0 nays, and 11 not voting. Senator Janssen requested a roll call vote on the motion to invoke cloture. The Janssen motion to invoke cloture failed with 30 ayes, 16 nays, 1 present and not voting, and 2 excused and not voting. The Chair declared the call raised." This was a hard loss. I can’t believe these Senators are in favor of fraud?! Apparently these Senators don’t think there is any danger of fraud. Or maybe they are in favor of not finding out. This was a hard fight and we are not going to stop. It would be wonderful to know more of the inside of the Unicameral on this. It would also be nice to have funding for the conservative organizations like the ‘Bold Nebraska’ group obviously has from organizations like MoveOn.org and Obama supporter Soros who funds much of the lefts actions like this. But pointing a finger at Soros is too easy and done too many times. The problem is the Unicameral. It is obviously under some influence that causes it to vote like this. There is a reason and it reeks of the same similar influence as the CIR did. 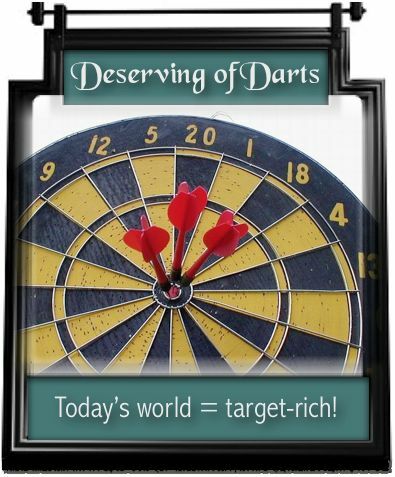 It would be great if those who follow the legislature so closely as claimed would come out and say it plainly. Do you have any nominations for “those who follow the legislature so closely as claimed”? Perhaps you can point us to such parties, so we might all apply to them. Perhaps you should speak plainer, sir. This article just underscores the point. We need Voter ID before the 2012 election!